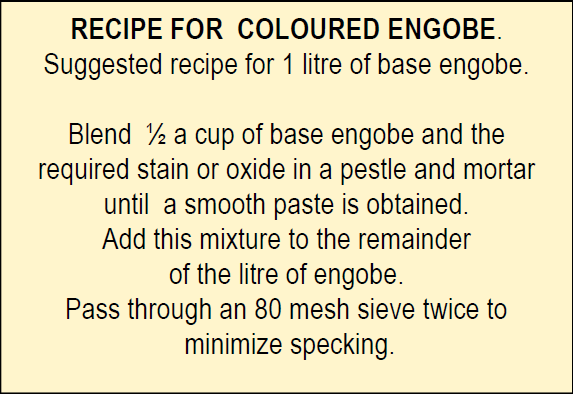 An engobe is a liquid clay that is primarily used for brushing or spraying over greenware and bisque fired pots to give a high quality finish, or simply used for decorating. It is also excellent for slip trailing, marbled effects and sgraffito. 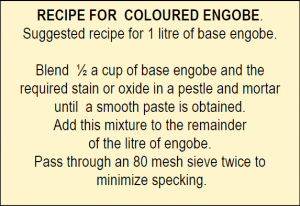 The Terra Cotta engobe is especially useful when you don’t want to risk contamination between white and terra cotta clays. Sprayed or brushed on it gives a rich terra cotta appearance. White Engobe EW/SW 1060 – 1280°C. Cesco Base Coat 1000 – 1180°C.